The Bioptechs Objective Heater is a system specifically designed to safely and accurately warm the objective of a microscope to prevent heat loss from the specimen when using immersion lenses. There are two main components, are the electronic controller and the objective heating attachment. The Bioptechs Objective Heater System is the only objective heating system that incorporates the thermal profile of the objective into the temperature control loop and regulates the objective temperature to the specimen plane where it belongs! When live-cell imaging requires the use of high numeric aperture lenses, it is necessary to control the temperature of the objective as well. This problem exists because the optical coupling medium (oil, glycerin or water) acts as a thermal coupling medium and draws heat away from the specimen. The thermal mass of a fluid coupled objective is overwhelming when compared to the thermal mass of the cells. Unfortunately microscope manufacturers do not offer temperature controlled objectives; nor do they consider the need for thermal regulation in the design of their objectives. Bioptechs has developed and patented a product that solves this problem for the majority of immersion objectives. To eliminate this thermal gradient, Bioptechs offers a patented Objective Heater® System which includes a heater/sensor and an electronic controller. The heater/sensor is comprised of an adjustable thin-film heating band which surrounds 3/4 of the diameter of the upper region of the central retracting tube of the objective. A surface probe thermal sensor positioned in the gap formed between the ends of the heating band measures the temperature of the objective. This heater/sensor assembly is supported on an adjustable metal mounting to fit objectives ranging from 14 to 37mm in diameter. (Diagram) The heater loop requires a minimum of 3.5 to 6mm longitudinal, physical contact with the cylindrical objective surface depending on which objective heater is required. In some cases there may be a decorative collar on the objective that must be removed in order to permit adequate surface contact. Depending on the objective, it may be necessary to invert the objective heater and mount the objective upside down for optimal thermal transfer to the lens of the objective. It may also be necessary to isolate the objective from the nosepiece turret for proper objective temperature regulation. Thermal Spacers are available from Bioptechs to reduce the heat sinking effect of the nosepiece and the other objectives on it. The Controller is specifically designed to slowly heat the objective over a fifteen minute warm-up period then hold the objective at the set point value within 0.2 degrees C. The Controller operates from ambient to 50 degrees C and has special safety circuitry which utilizes a 0.9 degrees C error window to shut down the controller and sound an alarm if, for any reason, the temperature of the objective deviates after it has reached set point. A user calibration test is also built in to the controller. Notice the temperature distribution in the following locations: nosepiece, bottom of objective, region above heater band, and top of objective. Power consumption after equilibration is 1.3 watts. The point is that, unless you warm the entire microscope, the microscope will always act as a heat sink with respect to warming the objective. You can expect a small thermal gradient. All objectives have different thermal profiles. Therefore, it is imperative to efficiently transfer heat to the core of the objective and prevent excess heat from radiating from the heater-band. This is exactly what the Bioptechs Objective Heater does! 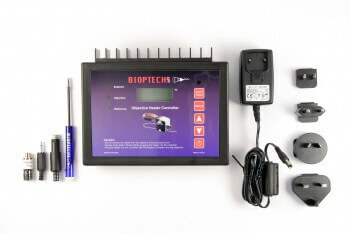 Click here for additional thermographic images of Bioptechs products. Not sure what heater to use? You can check this list for your objective and take note of the proper band size to fit your objective. You can use this reference page to measure your objective and select the appropriate heater yourself. If your objective has a decorative collar which prevents an efficient heat transfer, it will need to be removed. You can do this yourself with the aide of a special objective wrench and plier set available from Bioptechs or send in your objective and Bioptechs will remove it for free! Although there have been no formal studies relative to the effects of thermal cycling of objectives between ambient and 37 degrees C, Bioptechs has found that after selling and supporting thousands of objective warmers used for DIC, Confocal, MP, STED, STORM, SPD, Super Resolution etc. imaging, there have been no reported instances of objective damage due to daily thermal cycling between room temperature and 37 degree C. However, if you want to store the warmed objectives in a constant temperature enclosure when not in use, the Boekel desktop incubator is well suited for this application as well as a convenient place for temporary storage of specimens or media near your microscope.